Primary school classes are being recruited by the Unlimited Space Agency (UNSA) to enter a competition against classes all over the world and find out if they have what it takes to be an astronaut. They are mentored through the competition by two teenagers who are cadets in UNSA. If the class is successful in meeting each challenge – reporting on something curious in the world, demonstrating Galileo’s famous gravity experiment or modelling the entire solar system in their playground – then their mentors are selected for a simulation expedition to Mars in an unknown desert and the class become their Mission Control. But then, just like Apollo 13, disaster strikes and only the class can help get them home. Already enjoyed by over 500 pupils in more than 25 schools nationwide, The Astronautical Challenge has been praised by participating teachers. Jane Gibb, Flore CE Primary School. The Astronautical Challenge is an Adventure in Learning co-created by Unlimited Theatre and Coney as part of the solar system of pieces Unlimited made happen to orbit their play A Mission To Mars, which toured UK theatres in 2010 and 2011. Its aim was to get children excited about the bigness of the universe but that through science even the smallest people can tackle its challenges. We also wanted to make sure that it had real science at its heart. Drawing upon our Adventures in Learning expertise, we delivered The Astronautical Challenge to classes in collaboration with Makewaves, a groundbreaking social networking site designed specifically for schools. Coney’s support was constant and responsive, but online and invisible, enabling teachers to go on the adventure with their class while tailoring the episodes to suit each class’s needs. The premise of the adventure is that classes are invited to sign up as Agents of UNSA and take part in their world wide challenge to identify children with the potential to be the space crews of the future. To pass the Challenge, pupils must help existing UNSA trainee astronauts Gail & Stefan in completing a series of science-based and personal challenges. The teachers lead the class through the episodes, with the story and challenges responsive and bespoke to the class and the strengths and weaknesses of the individual children. Challenges involve groups of pupils working together to solve problems and make things work, researching and experimenting in the classroom to test and prove their theories. 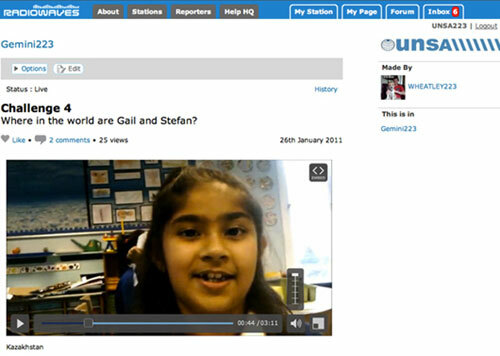 They communicate with UNSA by uploading their work as written, audio or video reports and stories onto the Makewaves platform, asking questions and solving the challenges. The adventure concludes with a dramatic, live finale where it’s up to the class to rescue Gail & Stefan and save the day. We were delighted when The Astronautical Challenge won Unlimited Theatre the Arts, Culture and Heritage category at the 2011 UK Charity Awards. Coney was here represented by Tom Bowtell, Tassos Stevens and others.